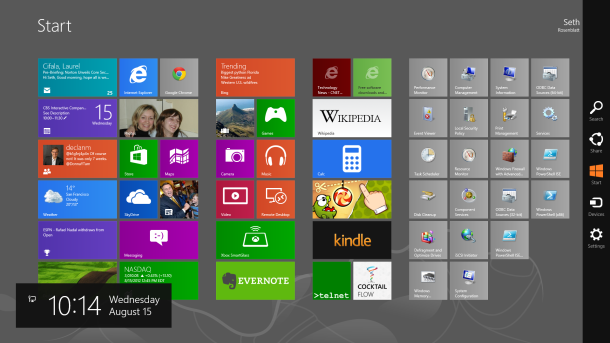 There are two ways to get Windows 8, which reached the public on October 26. You can buy a new computer or tablet running them, which is an attractive option because Microsoft is mandating its strictest standards ever for hardware manufacturers. However, Microsoft desperately wants people who own older Windows computers to upgrade. If you bought your Windows machine after June 2, 2012, but before January 31, 2013, you’ll be able to buy an upgrade license for $14.99. People with older Windows 7, Vista, and XP computers will be able to upgrade for $39.99. Overall Microsoft made an aggressive, forward-thinking, and bold statement for the future of PCs with Windows 8, and vast security and speed improvements more than justify the $40 upgrade price. Although the new app navigation is not easy to understand, and there are too many “unknown unknowns”, “Windows 8 embraces the future wholeheartedly. Log-in and boot times are fast, the apps look gorgeous, and the Sync feature brings seamless transition between devices” (CNET). I do consider all of the concepts you have introduced for your post. They are really convincing and can certainly work. Still, the posts are very quick for novices. May you please lengthen them a little from subsequent time? Thank you for the post. Thanks for the feedback, I will try to lengthen my posts to be more specific.